ASLMA-157 | Size: 50 ml / 1.69 fl.oz. With a soothing gel-cream texture, the night moisturizer encourages overnight skin cell renewal for a younger looking complexion. 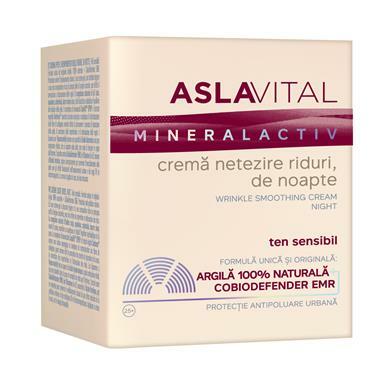 Enriched with natural origin active principles softens complexion, targeting multiple signs of skin aging including fine lines, wrinkles, elasticity and firmness. Natural Oils Complex (soy, squalane, calendula, shea butter) - Nourishes, promote suppleness and restores the hydro-lipid skin balance. Sepilift DPHP, an amino-acids complex, along with Centerox™, a collagen synthesis enhancer, protects and reinforces skin structure. Diminishes lines and wrinkles, rejuvenates skin, helping it recover its youthful volume, tonus and suppleness. Vitamins A&E - Fight cutaneous aging, remove formed free radicals, offering protection against environmental damage. Usage: Apply in the evening on a cleansed and make-up free face, neck and décolletage. Use either by itself or after your usual serum. INGREDIENTS: AQUA, GLYCERIN, GLYCINE SOJA OIL, CETEARYL ALCOHOL, GLYCERYL STEARATE, SQUALANE, ETHOXYDIGLYCOL, PHENOXYETHANOL, HYDROXYETHYL ACRYLATE / SODIUM ACRYLOYLDIMETHYL TAURATE COPOLYMER, DIMETHICONE, DIPALMITOYL HYDROXYPROLINE, CETEARETH-22, BUTYROSPERMUM PARKII BUTTER, TOCOPHERYL ACETATE, OLUS OIL, MAGNESIUM ALUMINUM SILICATE, PERFUM, TETRASODIUM EDTA, RETINYL PALMITATE, DIMETHICONE CROSSPOLYMER, FERULIC ACID, HELIANTHUS ANNUUS (SUNFLOWER) SEED OIL, ETHYLHEXYLGLYCERIN, MADECASSOSIDE, PEG-40 HYDROGENATED CASTOR OIL, SORBITAN ISOSTEARATE, POLYSORBATE 60, BHA, ASIATICOSIDE, GLUCOSYL CERAMIDE, PENTYLENE GLYCOL, ORYZA SATIVA BRAN OIL, GLYCOGEN, SODIUM HYALURONATE, CALENDULA OFFICINALIS FLOWER EXTRACT, SODIUM HYDROXIDE, BHT, TOCOPHEROL.